December Update – Merry Christmas! Merry Christmas from the C&H! Is it really that time of year already…. At the start of November the C&H had a stand at the Classic Restoration Show – see picture of the stand below. 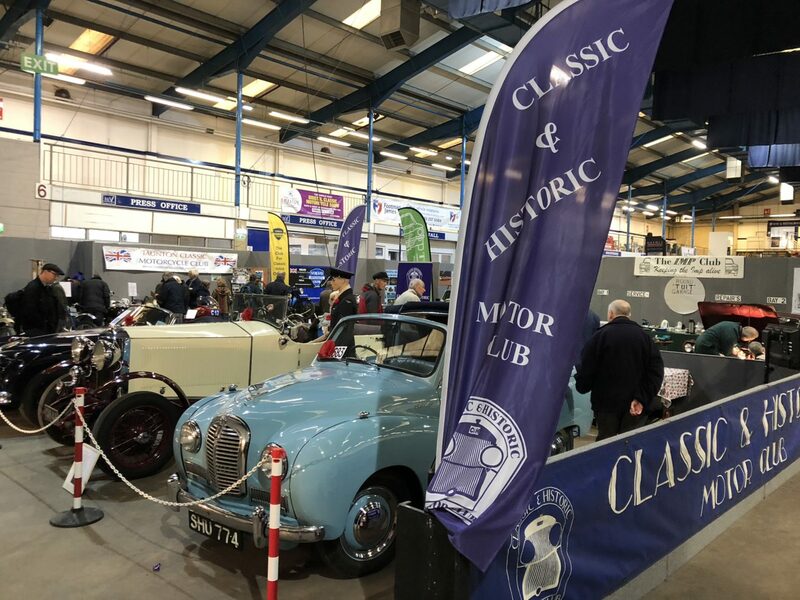 Many thanks to the stand organisers Geoff & Marie Wilkinson – her’s what they had to say about the club stand: “We were very pleased to have had displayed on the C&H Club stand Mike & Sandy McLennan’s Austin Somerset Tourer, with its fantastic paint job and a new hood done by Piper’s. We had it set in the Coupe de Ville position, which caused a lot of interest. Clive Rides brought along his 1930 Invicta High Chassis, a beautiful car that won the ‘Best Car – Runner Up’ at the show. Also on the stand was the Jaguar XK150 Drophead of Chris Marks, which also caused a lot of interesting conversations with the visitors”. The C&H Christmas Card: Once again, at this year’s Christmas Lunch on Sunday December 9th, 2018, as an alternative to giving individual Christmas cards to Club friends, there will be a large ‘communal’ Christmas card, where members who wish to can send their seasonal messages to friends in the Club. The card will also be on display at the New Year’s Trundle on 13th January, 2019. We will again have a seating plan at the lunch, which worked well last time. There will also be the opportunity to make a charity donation at the same time. Last year we raised £76 for Macmillan Cancer Support—which is our charity again this year—thanks to the generosity of our members. Wanted – Social Secretary: Ann Budd, who has carried out the function of Social Secretary so superbly for many years, has announced that she would like to step down at the forthcoming AGM in March. We therefore urgently need a member to come forward to take over this very interesting and important post right at the heart of Club affairs. There would of course be a lot of interaction with and help from other Club members. Some of the obvious qualities for the job are: enthusiasm for the Club, being a good negotiator, diplomatic and organised. The ability to attend the monthly Committee meetings would be preferable, although not absolutely essential. If you would like to have a go at this challenging and very enjoyable position, please have a word with our Chairman Paul Dickinson.